Atlanta, done properly, is all in the planning. Even if you’re in a hurry, there’s a lot more you can do in A-Town on a limited time budget than you might think. Before you ask, no, brunch is not one of them -- so don’t expect any advice on sneaking past lines at hot spots or any other such lies in this handy guide. These are serious tips on how to enjoy some of ATL’s greatest experiences when you don’t have a precious second to spare. 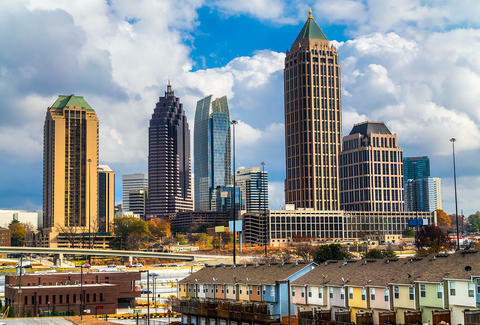 Take your time now and read the list below so that the next time you’re in Atlanta, you can fly through these good times whenever an hour opens up in your travel itinerary. 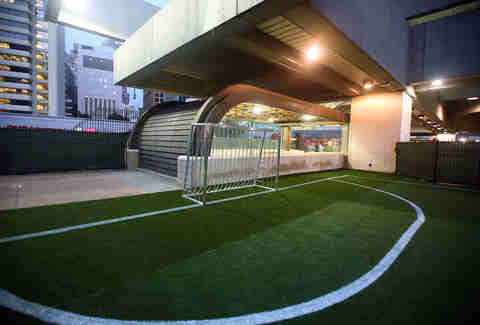 The just-opened Station Soccer is the first public soccer field located in a public transportation station anywhere in the world. It's at Five Points MARTA Station, which eventually you'll probably have to pass taking the train to the airport, unless you're already south of it. If you're driving, just park your car at a MARTA station that offers free parking (West End is just two stops south of Five Points, FYI), then catch a 5-min ride north, and you can hang for a while, before getting back to your car with time to spare. You'll not only retain your sanity by taking MARTA (Atlanta traffic is pure evil), but you also might meet some new friends to kick it with the next time you’re in downtown ATL. 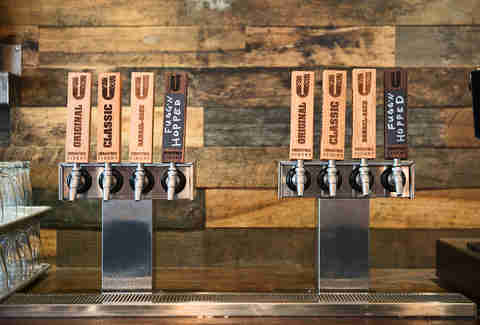 You could either hit the Westside, where you're close to two really great breweries (the IPA-specializing Scofflaw, and creative craft outfit Monday Night Brewing, whose "Tears of My Enemies" may be the greatest beer and beer name ever) and a cidery (Urban Tree) -- or just go to the recently opened Georgia Beer Garden and buy a variety of locally brewed 4oz samples. Every beer at the bar is from the state, and they're separated into various styles on a big, glowing back-lit board. If the weather allows, take it to the backyard and post up on one of the lawn chairs. This is Metalsome, ATL's nightly heavy metal karaoke event. The whole key to this is getting there just as it's starting up. The line to perform gets hella long but they keep it moving, so even if you're fifth in line you should be fine. It’s critical to know you can't buy your way onto the list. Don't be corrupt, be early! Get there too late, and you'll want to bang your head for an entirely different reason. Unless you’re one of those people who always happen to have a fold-out picnic basket on their person, it's best to improvise if you plan on having a meal in ATL's iconic Piedmont Park. Thankfully, nearby choices abound if you need a lunch that'll have you on and off the grass quickly. Woody's CheeseSteaks is just past the park's southeast corner, and their sandwich is much better than what you'd have slapped together, unless you’re Hector Santiago or something. There's also pizza at Mellow Mushroom, Mexican and Asian restaurants, and even a Trader Joe's (wine! cheap!) just a few steps down at Midtown Promenade. If you'd rather not walk, just order at Park Tavern, which sits on the edge of Piedmont Park and has awesome sushi. 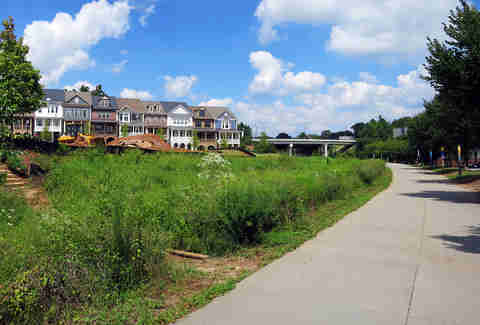 ATL's refurbished in-town railway, known as the BeltLine trail, is ideal for people-watching. There are lots of beautiful weirdos and ath-leisurely attired in-town suburbanites to wave at, or totally avoid eye-contact with, as you walk to or from Ponce City Market or Krog St. Market. The exercise will help you feel like you've earned a drink, so have one at PCM’s Biltong Bar or The Mercury. Being able to recommend certain sips by name will boost your credibility among BeltLine ATL drinksters, or at least make you forget that walking in ATL is a relatively alien concept. If you're hungrier than you are thirsty, Krog's Ticonderoga Club has stupid-good blue mussels, while Superica's tacos and spicy mezcal cocktails will handle your Tex-Mex cravings, Fred's Meat & Bread has one of the city's best burgers, and you can grab mind-blowing pork or veggie dumplings at Gu's. Oh, you'll know it when you see it. This sprawling mansion sits right off the road on Evander Holyfield Hwy (it's named for its former owner), just past the city limits of College Park (technically the home of ATL airport) in Fayetteville. It’ll probably take 40 minutes (in traffic) to get there if you’re Downtown, which means you have 20 to pose like a boss and make "uuUUH!" sounds outside the gate before you should get off The Boss’ lawn and avoid trespassing charges. Ormsby's on the westside is open from 11:30 to 3am on weekdays, so you always have a decent chance to unwind without drawing too much attention. 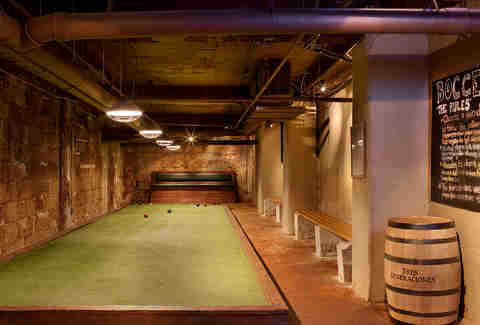 The underground hangout has bocce courts, foosball, pool tables, and more, plus really great beer (the owner used to work at SweetWater), pub fare, and fries. There’s also Joystick Gamebar, which has seriously good cocktails and old-school arcade games. 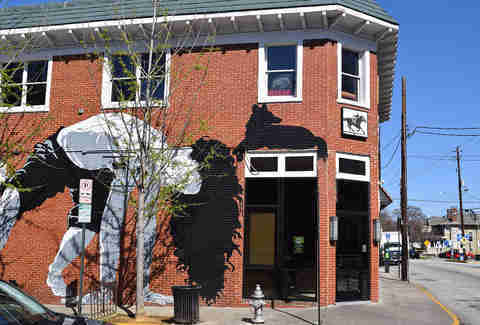 If you’re closer to East Atlanta Village, play parlor games at Brigantine Beer Parlor and Recreation Hall. It’s located in the back of Argosy, which also has great food (get the pizza if you can't make up your mind).